Yesterday was jam packed, and it’s Friday, and all the intensity is building toward Shabbos. But I have to say, yesterday was in no way a penultimate or lesser day because it’s not Shabbos. Yesterday was personally very special: I attended a class on connections between Lurianic Kabbalah and physics, which was very helpful in furthering my own personal and spiritual scholarship. And, drumroll please, as a newly educated Barefoot Sofer, I repaired a letter in a Torah scroll. I rendered kosher an unkosher lamed. One of the students had written Amalak’s name and scratched it out, I ritually washed my hands, picked up a goose quill, dipped it in special ink, chanted ‘LAMED’ (the name of the letter I was repairing), and set the quill to the surface of the letter and inked the missing parts of the letter. I just used words to describe some very simple steps in a rather mundane process. But believe me my holy siblings when I tell you that I felt the weight and the blessing of Heaven guiding the quill in my hand. Many of us left class yesterday in a variety of awestruck silence, feeling the blessing of contributing the work of our hands to Torah, and the measured weight of obligation to the scribal arts. There is so much more to say, but for me I know that yesterday I had my personal Kallah ultimate experience when I met another Kallah-goer, whose Torah is much akin to my own – it was as though our souls had been straining to meet one another across this entire lifetime, and finally we were close enough to share words. I’m not talking about romance … but rather a soul friend. I understand what Reb Zalman means when he says ‘My Holy Sibling’ because I found one. Yesterday was also the first time I stepped officially into the ring as one who may be seeking rabbinic ordination. I went to the ALEPH Ordination Open House and talked with teachers, students, and other prospective students. I was carrying with me the spirit of my friend Marty who could not attend, and who is also planning on moving into the rabbinic path. I spoke with Rabbi Shawn Zevit who is the new Associate Director of the Hashpa’ah program, the Spiritual Direction program. Since the program is so small each Director is able to answer questions across the board. After the fact, I realize I was nervous in this session, and a little bit closed off. When David answered my questions, he answered them with such sensitivity that my heart opened up. It was then I realized it had been closed in the first place. ALEPH teachers are very good like that. It’s one of the reasons the program seems like the best suited to my needs. I can get into my head and into a place of scholarship and text study and totally forget about my heart. ALEPH seems like the place that I can get a balance of text and heart, and personalized mentoring. I feel that such conditions are necessary for me to progress on the rabbinic path. Thank you for your attention to my personal journey, which also has the benefit of communicating some basic information about ALEPH’s rabbinical program to others who might be interested. If you happen to be one, check out our Ordination page, but more than that, email or phone and connect with one of our directors to meet a human with whom you can be in relationship about this weighty matter of discernment. Last night was a Magic Show by Arthur Kurzweil, which was an utter delight. 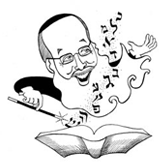 He interwove tales and Torah through his magic tricks. It was two hours long and it felt like a minute. Check him out! He’s also teaching a class on Adin Steinsaltz’ book The Thirteen Petaled Rose. Do you see her, emerging from the forested fields? She stands regal as a cedar. Her face shines in the surface of the lake. Hold my hand, let’s run out to greet Her! Posted in ALEPH Kallah, General Interest and tagged Adin Steinsaltz, Arthur Kurzweil, Kallah, Lurianic Kabbalah, Rabbi, Rindge New Hampshire, Shabbat, Torah. Bookmark the permalink. Kol hakavod to you for approaching the possibility of this rabbinic path! May your journey bring you blessings.